The first Festival of social Tango in the United Kingdom was organised by our friends and Tangokombinat comrades Andreas Wichter & Lynn Collins. Andreas is teaching in the UK for some years and has been invited to Southhampton, Bristol, Cardiff, London and other places. He and Lynn are living in Totnes, Devon a lovely small town at the river Dart surrounded by tolkienesque hills and filled with stores that sell crystals and homemade shoes. This is Hobbit country. The Shire par excellence! The Festival itself was set on Dartington Hall Estate nearby, a conglomerate of picturesque houses, the most beautiful garden in the world and some very functional multipurpose buildings, that host all kinds of cultural activities and art. On the same weekend, a festival in honour of the poet Rabindranath Tagore took place on the estate and you could enjoy all kinds of indian-inspired food, colourful people and (obviously) an elephant in the garden. The Festival offered lots of opportunities to dance over the weekend. There were Practicas every day, two afternoon Milonguitas, two big Milongas on Friday and Saturday, and a Despedida on Sunday. The concentration of so many Milongas, a big choice of classes and many people sharing Embraces, meals and discussions on this lovely spot in Devon, really made this event stand out. From all the Encuentros and Festivalitos this was definitely the most festival-like one. All DJs presented traditional music in Tandas and Cortinas even during the Practicas. There were Jill Barret (UK) and Deke As (UK) for the Practicas, Celine Deveze and Philippe Gonella for the Milonguitas and Enrico „il Mali“, Uwe Willié and myself of the Milongas. I already mentioned Celine, Philippe and Enrico in my description of the YSM3 in Crema. Uwe Willié is our comrade in the Tangokombinat and was chosen for the Sunday Despedida. It‘s a actually speciality of his as he concentrates on Tandas of a more romantic and peaceful ambiance. Perfect for the final notes of a Festival. We (Detlef & I) were teaching alongside Marek & Olivera Szotkowski and were focussing on the embrace, movements for crowded floors and musicality in order to attract the right crowd of dancers. As each of us did a „full programme“ (10 hours) of teaching over the weekend, we did not have the time to attend the afternoon Milonguitas or Practicas - apart from the initial guided practica of course. It was fun to work at the Abrazos Festival: the class rooms were big enough and equipped with an excellent wooden floor, the organisation was impeccable. All classes were sold out. There was one special offer: each teacher was available for four „Privatandas“, mini private classes of the length of a Tanda. We already know the concept from the USA and like it a lot. It is a very dense kind of work, where you have to concentrate on one or two aspects. The big upside is, that you do not „overload“ the student with information. From what I can tell of the feedback, the participants got a lot out of it. We did a short demo (2 dances per couple and one Vals together) on Saturday evening. Detlef and I danced two Tangos by Di Sarli as an illustration of our teaching during the day. We had given a special class on Di Sarli‘s oeuvre and wanted to demonstrate the interpretation of different styles of Tangos by the „Senor del Tango“. You can see our demos here and here. 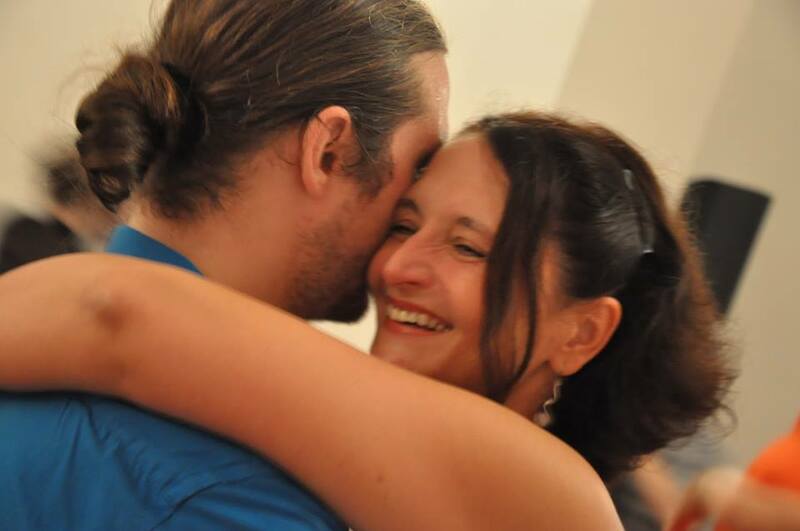 Marek and Olivera danced to a Tango by Laurenz and a Milonga in their very elegant and personal way. I will add a link to heir demo, as soon as it is online. The locations were very, very convenient. As I already stated: wooden floors, state of the art technique and sound, appropriate sizes, nice arty ambiance.... The Practicas and Milonguitas took place in the „Hex“ a hexagonal hall with an arena-like tribune for seating and some additional tables and chairs. It was situated in the same building as the classrooms, including dressing rooms with showers, a vendor of shoes, a food stand and the reception. The Friday evening Milonga took place in the same building in the very nicely decorated large hall. I preferred this hall to the one of the Saturday and Sunday Milongas, which was set across the Estate in another building. This one was a tad „long and narrow“ for my taste. But nevertheless all places were perfectly fit for a Festival of that size, creating a very pure ambiance! The majority of the dancers came from the UK and we knew many from former visits. It was great to meet them again and see them dance so nicely with our friends from the continent, who flew in from France, Italy, Slovenia, Germany, Sweden and Denmark. Let‘s not forget our Scotch and Irish friends of course! I was very much impressed by the discipline and respect of the dancers on the floor and amongst each other. I have visited several british Milongas in the last three years and found the behaviour (outside of London) quite decent, but there were always some rascals on the floor, disturbing the Ronda. This was not the case at Abrazos! I have never-ever seen such a perfect Ronda with 2-3 concentric circles in all my Tango life, not even in Buenos Aires or in the most renowned Festivals. Obviously, the special emphasis on social Tango, the embrace and the „reglas“ in the publicity and choice of classes really had an impact. I know by personal feedback of participants, that they‘ve never experienced such a peace- and respectful ambiance at a Tangoevent in the UK before. The emotions ranged from tears to laughter of pleasure. Even I was touched by the harmony of the couples on the dancefloor, when I was sitting with my aching feet up and watching the crowd dance the last Tanda to a perfect Tango by Di Sarli. Whilst receiving a foot massage by my favourite foot-massage and Di-Sarli person. What more can I ask for? Andreas and Lynn are already planning next years event, which will most likely take place on Dartington Hall Estate again. This is only the beginning of a deep friendship between british and continental Milongueros. The social Tango in a close embrace has found a new home on the island and there will hopefully be many more Abrazos. We‘ll sure be back! Not that I can even spell queueing, today. I'm a little bit doubtful about the notion that hobbits are into crystals, unless it's possible to smoke them. Not sure about Hobbits and Elves and Wizards but Abrazos was a magical weekend. Can't wait until next year. Are you saying that everyone either had hairy feet, pointy ears, or weirdy beards? Nah! I referred to the grace of the women, the cuddly embraces of the men and the magical work of the DJs! Here's your Elves, Hobbits and Wizards! I must be on your mailing list, but please be sure I get notified of this hobbit festival next time! The reasons, why I don‘t dance.